Today I walked 12 miles in the redwood forest. My feet are tired. I couldn’t imagine putting on a shoe with a heel right now, but I did. 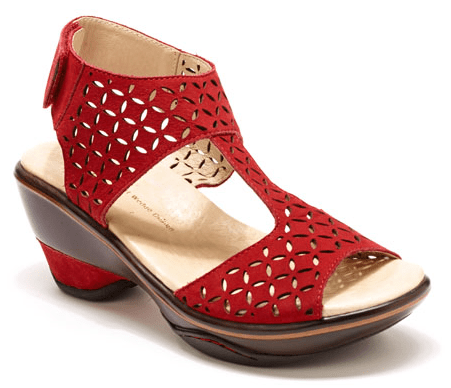 We were sent a pair of Jambu Women’s Butterfly Platform Pump in Red to try. When I first opened the box, I thought, these shoes are hot! I’m not sure I can pull it off! I usually don’t wear a heel this high, as I am tall, but when I put them on my sore feet, I could not believe the way I felt. They were so comfortable. I felt I could go dancing or walk another 12 miles! As much as I don’t like stinky feet, I do worry about anti-bacterial products. Do they use nanotechnology? Jambu is a brand I have seen around at outdoor stores, but I have never owned a pair. It is company committed to reforestation. Jambu has committed to plant 50,000 trees across five U.S. forests targeted for restoration. This is enough trees to cover Disney’s Magic Kingdom… twice! In this small way we hope to preserve our great outdoors for future generations. Inspired by the beauty and mystique of the rainforest, Jambu™ is an outdoor inspired footwear brand that uses recycled, recyclable and re-usable packaging. Jambu™ outsoles are made with partially recycled and re-usable compressed rubber. I truly was amazed by the comfort of these shoes, and I can’t wait to wear them with a skirt or dress. The comfort of good walking shoes combined with some lift and fashion makes for a perfect combination. No break in time…just perfect comfort. I agree, that red shoe is hot and it is a relief to know that in spite of its added height it still brings comfort to the feet. 🙂 Of course, the company’s commitment in reforestation made it even a better buy. I’ll check out other Jambu products. Thanks for sharing!